There seems something entirely appropriate about a quote by Pulitzer Prize-winning American poet Rae Armantrout on the back cover of poet Emily Kendal Frey’s first trade poetry collection, The Grief Performance (Cleveland OH: Cleveland State University Poetry Center, 2011), winner of the 2010 Cleveland State University Poetry Center First Book Prize, selected by Armantrout herself. Frey’s poems echo some of Armantrout’s short lines and short bursts in longer sequences, and work to negotiate light against the dark. Composed in three sections, the first two of shorter poems and the third of a longer sequence, “A Meditation on a Meditation of Frost,” Frey’s The Grief Performance is a celebration wrapped up in mourning, especially in the final six poems of the first section, all titled “The End.” “My mother / and her dead // sister are / watching me,” she writes in one of these, a short poem as longing, responding to a call, as she ends the short piece, “and I love / how they call // me flower / so I walk // closer / toward the light // that is them.” Frey’s poems are direct and open, meditational without falling into sentiment, writing out the important stages of grief. 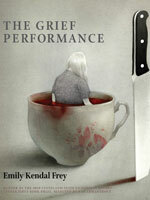 Isn’t grief, in any and all of its stages, an element of performance, even if just for an audience of the self? gentle, not hard, they love it. New feathers that grow in plasticky sheaths. You have to break them up with your fingers. Fabulous. A head massage for the birds. with a beak or fingernail. Remove the sheath. It’s heavenly. They’ll melt in your hand. You will see. you can make with your mouth. weeping for God knows what.